We’ve been using apps now for around three years, so today I want to highlight one which has been with us the whole way. After all, how often do you download a game only for it to be played with for a few weeks, and then forgotten about? Luckily there are apps like My PlayHome, now joined by its sister app My PlayHome Stores. It’s one of the first apps I ever reviewed back in May 2012, and it has gone from strength to strength since then. 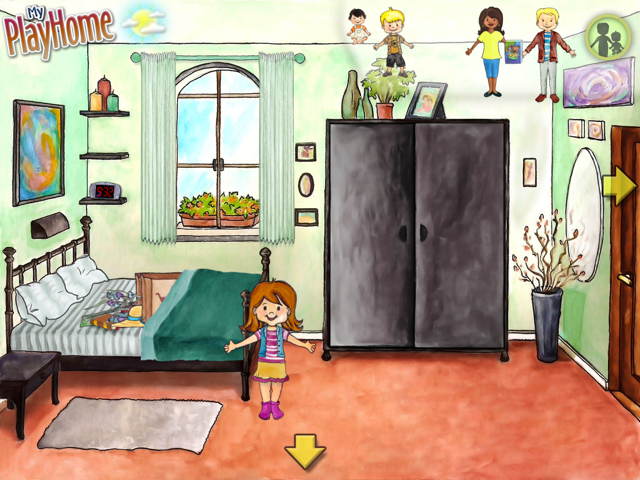 My PlayHome is an open-ended app which allows children to play with a virtual dolls house. The original family of five characters has now been expanded to include a range of families from diverse backgrounds. The kitchen, living room, bathroom and kids’ bedroom have been joined by a garden, parents’ bedroom and dressing room too. 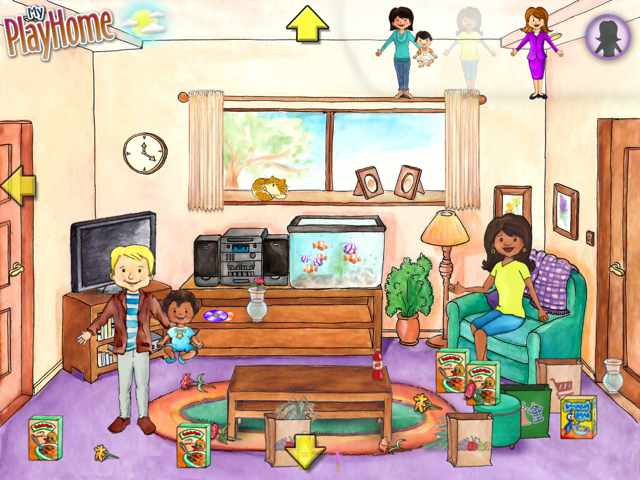 Little Miss Chatterbox began using the game before she was two and still regularly chooses it aged four and 3/4. One of the reasons is that there is so much to play with, as most objects are interactive. Unlike sticker apps, which usually seem quite static, everything here actually works. You get great sound effects too. If you give someone an apple, they will eat it, one crunch at a time. Put someone in the shower and turn it on, and they will get wet – then use the towel to dry them. You can cook on the hob, change CDs, play with toys and handily put things in the bin when you don’t want them any more. In many ways it is like a mini version of the Sims with no rules or goals. Fairly frequent free updates (I would guess every four months or so) also keep the game fresh. No in-app purchases to worry about here. The app is perfect for world building, role play and telling stories. Two children, or a parent and child, can easily play together. My PlayHome Stores is a separate app, but joins seamlessly with My PlayHome so you can walk out of the house and to the shops, then bring your purchases home with you. 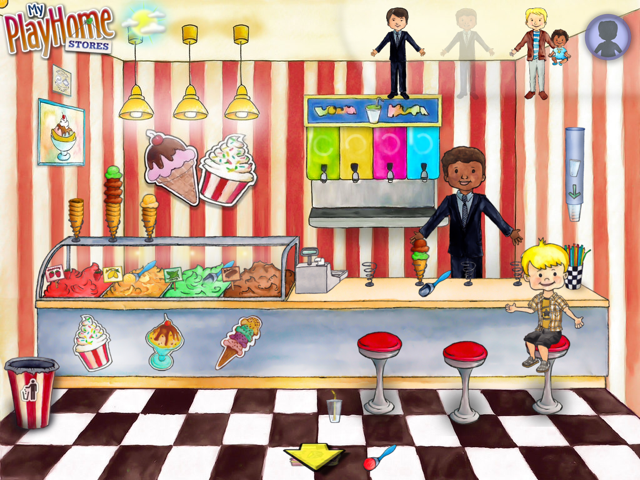 Locations include a street scene, greengrocer, clothes shop, supermarket, and ice cream parlour. This last one is our favourite, as you can make fantastic combinations of ice creams and slush puppies to serve your customers. See http://www.myplayhomeapp.com for more information. My PlayHome, developed by My PlayHome Software Ltd, compatible with iPad ,iPhone and iPod Touch. Available from https://itunes.apple.com/gb/app/my-playhome/id439628153?mt=8 priced £2.49/US$3.99 at time of writing. My PlayHome Stores, https://itunes.apple.com/gb/app/my-playhome-stores/id683942610?mt=8 priced at £1.49/US$1.99 at time of writing.